I thought I was doing better yesterday until around five. That’s when the low grade fever and bloating that made me look like a pregnant woman hit me hard. I was so close to going to the ER, but I dug deep until the Tylenol kicked in and reduced the fever and pain. This morning the doctor placed me on a liquid diet, which is a frigging drag. It seems to be helping, however, as I’m not running a fever tonight and feel a little better, though I still look pregnant. I have a doctor’s appointment in the morning. Can’t wait to see what ails me. 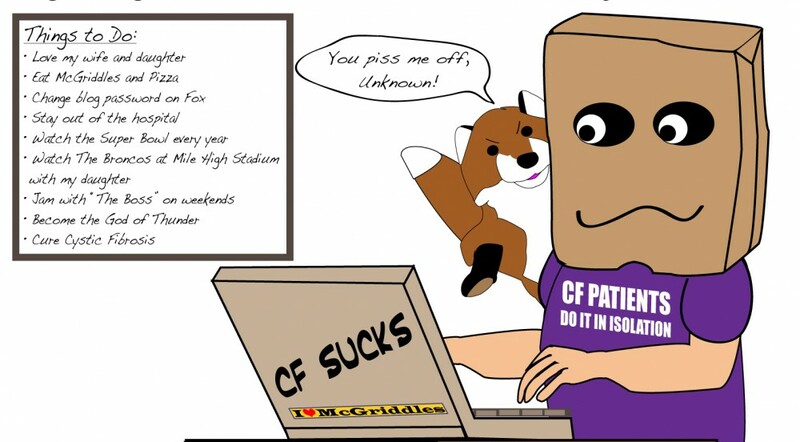 Ah, the joys of CF. That’s it for tonight. All the best to everyone. Hope you are back on a steak and potatoes diet soon!What do you do for a living? I need a visual. That, my dear pink friend, must for now remain a mystery for what would life and our relationship be without some mystery. How deep is that? All in good time, Cystic Gal. All in good time. that stinks. wishing you luck at your appointment! Ginger, thank you. How nice of you to say. If it’s not one thing, it’s five others. This too shall pass, I hope. I haven’t see any new posts from you so I happy that means you’re feeling well. Very funny, CG. I’m surprised you don’t post one of those pictures each day.